Or maybe it should be ultimate trousers v 5, as I have now made 3 trial versions and 2 ‘wearable’ versions. This is the re-sized version in the stretch denim. They don’t look much different to the previous post on the subject, but they are about 3″ smaller round the waist and hips, and tapered down the side seams to just below knee height. They have been ‘road tested’ for a week or two, and have passed! They came straight off the ironing board to be worn when they were re-finished. So I wore the original pair when I went up to Leeds to see the family, but I had a wander round the town centre first. They were fine during the long drive in the car, but as soon as I started to walk round town, they felt as if they were falling down all of the time. Checking cautiously in my reflection in shop windows (and no, that is not normal behaviour for me! ), they didn’t actually look as if they were going to fall down, so the only odd thing was that I was constantly hitching them up. It was so bad that I ended up popping into M&S to buy a pair of black trousers, which I changed into as soon as I got to my brothers. I pondered the situation for a few weeks (most of which I was in Australia….) After all of the effort, they not only needed to be fixed, but I had hoped that the Ultimate trousers would be my go-to pattern in any fabric if I needed new trousers, and that was absolutely not where I had got to. I was also well aware of the statement that it is very difficult to make a good fitting pair of trousers on your own, and I have only one friend with any sewing capability and she lives 120 miles away. Maybe I needed to tweet the rest of the #SewBrum team and see who replied. I didn’t. So out came the unpicker – waist facing off, zip out, side seams unpicked to about 8″ from the hem. I’m pleased that this is a relatively simple pattern and lends itself relatively easily to such action. I basically just used a mirror and some pins to re-size, tacked, tried on and so on……. Zip back in (although not as good a concealed zip as some of my previous work), slightly shorter waist facing back on, understitch yet again, finish the new seams, move the label, press and wear! They are still the most comfortable trousers that I own. I had ideas about re-designing with a waist band to help them stay up, but with a better fitted pair, actually I think that the facing is preferable. Now the road testing: I did a full day’s action around the house, bending and stretching as you do. Critically, I walked the 3 miles to Harborne and back, and at no point did they feel that they would come down. Major success. But they were clearly stretching a little with wear, so I washed them to ensure that they returned to their original size, or even slightly smaller would have been acceptable. They returned to their original size. I note Carolyn’s similar experiences at allspiceabounds, and would also say that the cut is still a bit ‘frumpy’ i.e. not ever so tight, but I am a bit older so maybe not so bothered (! ), and I would be scared to make a very tight fitting pair, partly on the basis that once the fabric has gone, you cant get it back. But there is still the matter of the impact of stretch fabric to be resolved. 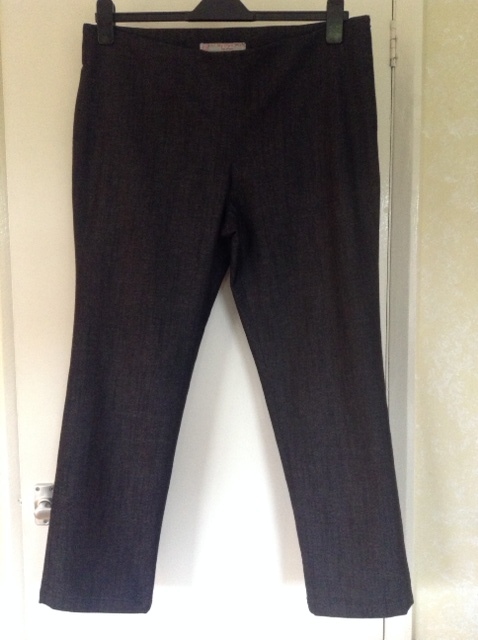 I have sufficient Vietnamese gaberdene to make a set of grey trousers, but there is no stretch in that fabric. Will my original version (version 3 – the final mock up) be good for none stretch fabric? I have no plans to find out in the near future, but will one day. Thanks for your comment and for taking the time to read my blog. Ann, I’m glad to hear you are persevering with your pant-sewing adventure! I admire your determination. I feel like there is some magical pant secret that we are both missing out on – why do our pants keep falling down?? 🙂 I have a rather straight lower half, so I wonder if my lack of hips to hold the pants up is part of my problem. Keep on tweaking your pattern! You will get there, I have no doubt. Thanks for your comment Carolyn. I was looking at Gertie’s Vintage Casual book last night and wondered about giving her pattern a go. Her patterns are supposed to be designed for ‘chunkier’ people like myself. Keep in touch about progress and keep on sewing. 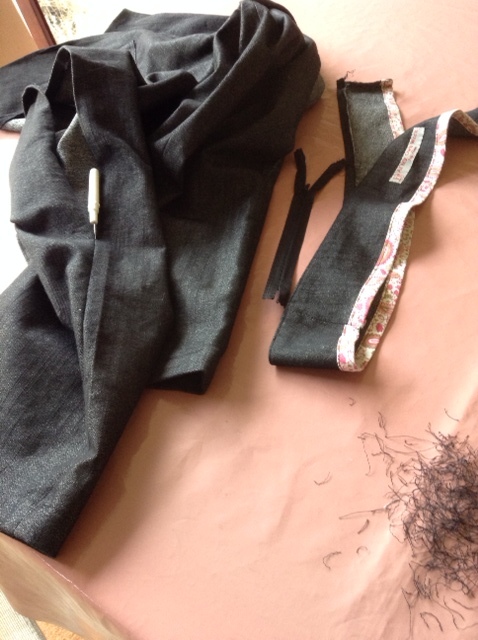 This entry was posted on March 22, 2015 by ann hebden in Fashion, Sew Over It, Sewing, Trousers, Ultimate Trousers and tagged Fashion, Handmade, Sew Over It, Sewing, Trousers, Ultimate Trousers.